Channeling my inner Ina Garten, I wondered what to make for a friend coming to tea who loves dark chocolate and green tea lattes? 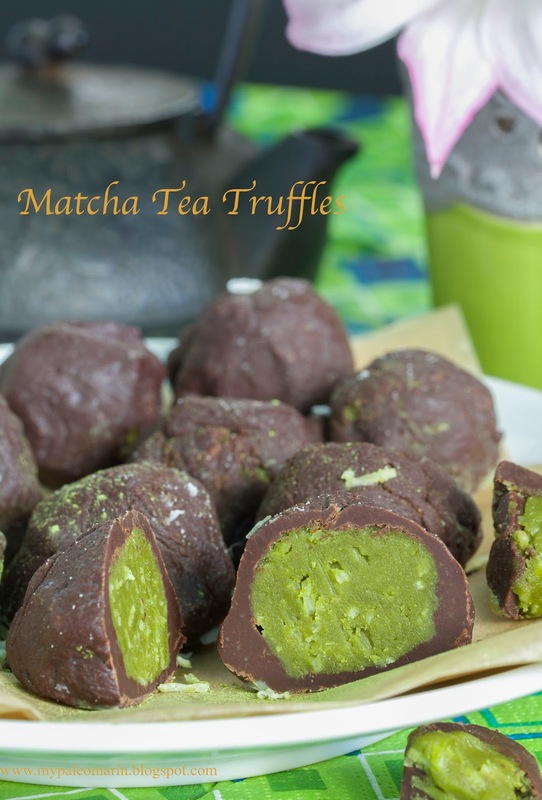 Matcha Tea Truffles, of course! If you appreciate the health benefits and tastes of green tea, coconut, and dark chocolate, you also will love these melt-in-your-mouth treats. For homemade almond milk, start the night before and follow the recipe here. 1. In a food processor, mix the coconut butter, match tea powder, and maple syrup until well blended, about 30 seconds. Stir in the shredded coconut with a wooden spoon. 2. Put mixture in a bowl, cover, and refrigerate for about 15 minutes, or until it is firm enough to form into balls. 3. Using a heaping teaspoon of filling, roll into a ball, and place on parchment paper on a plate. When all balls are rolled, place in the freezer for about 10 minutes. Makes about 24 balls. 1. If you have the patience and a candy thermometer, omit the almond milk and melt and temper the chocolate as described here. The result will be a beautiful sheen on the chocolate, and the balls can dipped and covered with chocolate using 2 forks. 1a. Put 2 inches of water in a pot and add a wider metal bowl on top to make a double boiler. When the water boils, add the chocolate pieces and the almond milk. Stir with a wooden spoon until all the chocolate is melted together. Remove from the heat, and add enough milk so the chocolate is thin enough to roll the balls of filling in. Stir briskly to mix the chocolate and milk together. 2. When the balls are firm, roll them in the chocolate with your hands until they are covered. Place them on parchment paper on a plate. Place the plate in the refrigerator for about 2 hours. Makes about 24 truffles. Keep refrigerated for a few days, or freeze. Recipe adapted from My Whole Life website.